AVS Audio Editor 7.2.2.488 - Download Win Apps. 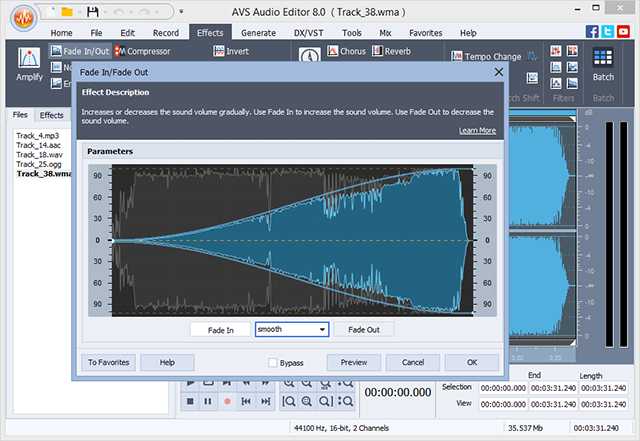 Edit your audio collection with AVS Audio Editor..
Edit, trim, cut, record, split, apply effects and filters. Manage your tracks in MP3, M4A/M4R, FLAC, SHN, APE, VOC, MIDI, etc. with AAE. Edit audio directly in your video recordings. Create a unique ringtone for iPhone. AAE is a part of the AVS4YOU.com package. Register once at avs4you.com and work with over 20 tools from the AVS4YOU.com package. Subscribe for $39/year or $59/lifetime. Compose your own ringtone, melody or complete arrangement with ease! it is a powerful inexpensive MIDI Editor for Windows based on the piano roll interface. The Editor lets you arrange bar-lines manually or by ear with the Tapping Tool. Intel/AMD compatible at 1500 MHz or higher, 512 MB or higher RAM, sound card.